Wordless Wednesday Link-Up: It's Elsa! We said goodbye to Frito T. Cat a few weeks ago--and there has been a void in the house. We needed to fill one kitty vacancy--and we hadn't had a spring kitten arrive yet--so it was off to visit the shelter cats that visit a local pet supply store. We met Elsa--and thought we would share Miss Elsa as this week's Wordless Wednesday Link Up! Okay. Her name from the shelter was Maddie--and since our youngest human is Madelyn/Maddie...that name was not going to work. We pondered the usual, white cat names....Snowball, Snowflake, Angel, Snowy....then--Walt Disney reared his princess filled influences--and out latest addition to the family became Elsa. Yep. Frozen named our cat...with the help of two little people who can't stop singing Do You Wanna Build a Snowman? and Let it Go... BUT--we think she does LOOK like an Elsa. And we think she's beautiful. And we are so glad to have found her! Now it's time to Link Up your latest Wordless Wednesday posts! Hi there, Elsa! She is a cutie pie! Oh she is so cute!! Congrats! oh... How Cute!!! Congratulations on your new addition. Congrats on the new addition to your family. 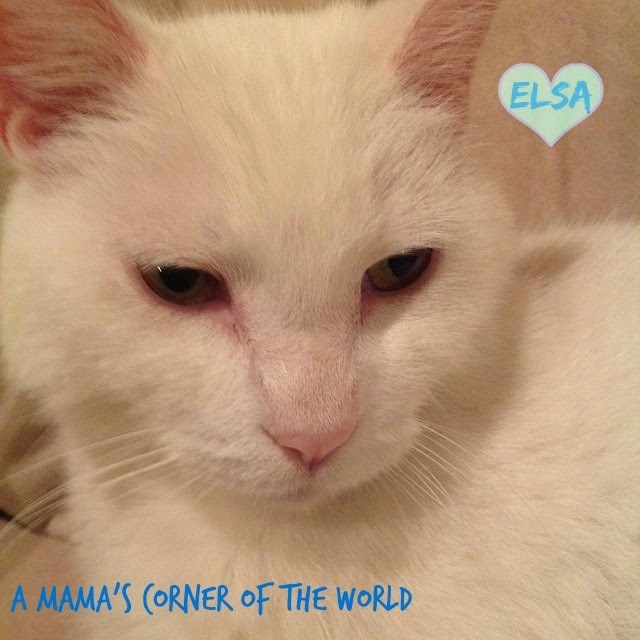 I think Elsa is a great name for the cat. How fun! I hope she get used to her name well. Beautiful kitty!! I had a white cat when I was a teenager. Unfortunately my son is severely allergic so no new cats or dogs for us. Congratulations on the new kitty! I love the name Elsa but I'm the only person on the planet who has not seen Frozen. What a wonderful name for such a pretty little white kitten. I was given a tortoiseshell cat when I returned from having surgery to be with me, I named Esmeralda.